The lobster has had a long and varied history in the culinary world. Currently, lobster is considered a delicacy and their prices can run quite high, but there was a time when this wasn't the case. Historically in North America lobsters weren't considered food, they were used as fertilizer and bait for other fish. It wasn't until the 19th century that people began to cook with them commercially. Before that lobster was considered food that was only suitable for prisoners. While lobsters aren't difficult to cook getting to the delicious meat inside their shells can be quite a challenge. Given the difficulty modern man can have cracking these shells, it's not hard to see why the colonists would have preferred sea creatures that were less of a battle to eat. For salads: cooked monkfish can be substituted for cooked lobster. Lobster must be cooked before it is eaten. The meat inside the tail and claws is the main draw for lobster aficionados, but if you are tenacious enough, each of the small legs and feelers also has tiny succulent morsels. Getting to the meat inside the smaller legs can be a difficult shell to crack, but it's defiantly worth the effort tastewise. The coral and tomalley are also tasty treats for the lucky diner with a whole lobster. The intestine, which runs down the back, and the sand sac in the head should be removed and discarded. The lobster shell makes a wonderful stock which can be used to flavor seafood soups, bisques, and stews. Crushed shells can be simmered gently in melted butter as a flavoring. Sift out the shells and save the butter to cook seafood or use as a spread. When you order lobster tail in a restaurant or purchase frozen lobster tails, you are most likely getting spiny (Florida) lobster or rock lobster, relatives of the Maine lobster. These are claw-less, with the edible portion primarily coming from the tail. The meat is a bit stringier and less sweet, but still quite delectable. Lobster can be boiled, steamed, broiled, grilled or stir-fried. Freshly cooked lobster is often served with drawn butter or lemon. Famous lobster dishes include Lobster l'Americaine, Lobster Thermidor, and Lobster Newburg. 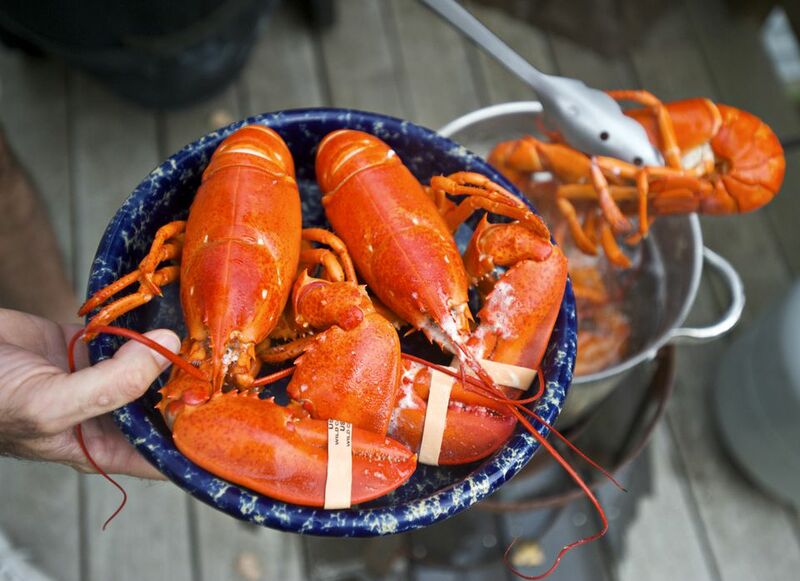 Lobster-lovers usually prefer their favorite crustacean pretty much naked, with nothing to disguise or cover the sweet flavor or ruin the delicate texture outside of a healthy dollop of clarified butter perhaps. As you learn more about cooking with shellfish, keep in mind that crab can be substituted for many of these lobster recipes if you so desire. Likewise, lobster can also be substituted for crab in most cases.